Antonio Lopez de Santa Anna was born in Mexico on 21 February 1794. As a young officer, Santa Anna rebelled against the government, gaining considerable popular support. He was elected president of Mexico in a democratic election in 1833. He soon decided that Mexico was not ready for democracy and pronounced himself dictator. Santa Anna's abolition of the Mexican constitution in 1834 lead to Texas' break with Mexico. He took personal leadership of the campaign to subdue the Texas revolution, notably when his 4,000 man army captured the Alamo after a thirteen day siege on 16 March 1836 -- killing all 187 defenders, including Jim Bowie and Davy Crockett. Ten days later, in spite of pleadings by prominent officers, he ordered the slaughter of over 400 surrendered prisoners at Goliad. Their bodies were burned, with the remains left exposed to vultures and coyotes. Mainly because of these two events, General Santa Anna would become the leading villain in Texas history. In the end, however, his overconfidence and carelessness (he neglected to post guards and was taking a siesta) allowed Sam Houston to win a crushing victory at the battle of San Jacinto. Santa Anna, taken prisoner by Houston, signed a treaty guaranteeing the independence of Texas, then returned to Mexico in disgrace. Accusing Santa Anna of treason, Mexico repudiated the treaty. Santa Anna was down but far from out. In 1838, as ridiculous as it sounds, a French baker in Mexico City claimed his shop had been looted by Mexican soldiers and demanded compensation from Mexico. He was backed by the French government, which was trying to pressure Mexico into a trade agreement. Eventually, this dispute resulted in a bombardment of Veracruz, which became known as "the French Pastry War". During the battle, Santa Anna had several horses shot out from under him and lost his right leg below the knee. Santa Anna became the "hero of Veracruz". He soon resumed the presidency. In 1842, he arranged for an elaborate ceremony to dig up the remains of his leg, and to parade with it through Mexico City. He then had it placed on a well-known monument for all to see. His eccentricity was only exceeded by his greed and extravagance. He outfitted his own private army. He also gave an endless round of fiestas, most of them in his own honor. In order to raise money, he raised taxes to an oppressive level. By 1842, the treasury was broke and Santa Anna was unable to pay his army. Forced out by a rebellion, Santa Anna went into hiding in the rugged mountains. He was caught by government troops in 1845 and was exiled to Cuba for ten years. Meanwhile, relations between the Republic of Texas and Mexico became increasingly strained because many Texans now desired to become part of the United States. In February of 1846, the last president of the Republic of Texas, Anson Jones, raised the United States flag in Austin. This action caused Mexico to break diplomatic relations with the United States, and the two nations eventually declared war. Corresponding from Cuba , Santa Anna persuaded U. S. President James K. Polk that he could solve the dispute over Texas. Polk ordered American warships to allow safe passage for Santa Anna to land at Veracruz. Santa Anna immediately reneged on his promise to Polk and began to organize resistance against the U. S. When war began, the president of Mexico promptly named Santa Anna general of Mexico's armed forces. Santa Anna soon resumed the presidency as well. This set the stage for the entry of General Santa Anna into Tazewell County History. At the outbreak of the war, Captain Edward Jones and Lieutenants Leonard Knott and William Tinney of Tazewell County formed Company G, Fourth Regiment of the Illinois Volunteers, joining a division commanded by General Frank Shields. They landed in Veracruz with General Winifred Scott. They soon moved to assault the Mexicans at Cerro Gordo, a position which controlled the road to Mexico City. On 18 April 1847, the main part of the American forces assaulted the Mexican batteries head on, led by Captain Robert E. Lee, assisted by Lieutenants U.S. Grant, P. G. T. Beauregard, and George B. McClellan. At the same time, Shields' division, including the Tazewell County volunteers, made a wide encircling movement through mountainous rugged terrain in order to try to come upon the Mexican position from the rear. 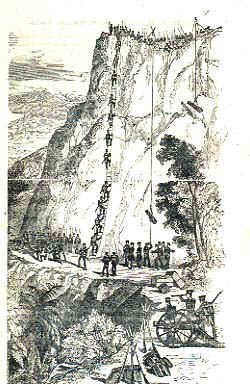 The Mexican forces had assumed this route to be impassable. "General Santa Anna, accompanied by some of his adjutants, proceeded by the road to the left of the battery, when the enemy's column, now coming out of the woods, absolutely prevented his passage by a discharge which obliged him to fall back. The carriage in which he had left Jalapa was riddled with shot, the mules killed and taken by the enemy, as well as a wagon containing sixteen thousand dollars, received the day before for the pay of the troops. Every tie of command and obedience now being broken among our troops, safety alone being the object, and all being involved in a frightful whirl, they rushed desperately to the narrow pass of the defile that descends to the Plan del Rio, where the General-in-chief had proceeded, with the chiefs and officers who accompanied him. Horrible, indeed, was the descent by that narrow and rocky path, where thousands rushed, disputing the passage with desperation, and leaving a track of blood upon the road. All classes being confounded, all military distinction and respect were lost, the badges of rank became marks for sarcasms, that were only meted out according to their grade and humiliation. The enemy, now masters of our camp, turned their guns upon the fugitives. This augmented more and more the terror of the multitude crowded through the defile, and pressed forward every instant by a new impulse, which increased the confusion and disgrace of the ill-fated day. Cerro Gordo was lost! Mexico was open to the iniquity of the invader." When the Illinois Volunteers surprised the Mexicans by screaming and shooting as they charged from the woods, they weren't aware they had almost captured General Santa Anna and ended the Mexican-American War five months early. After his carriage had been destroyed, a Mexican calvary soldier grabbed the general, carrying him to safety. First Sergeant Samuel Rhodes, Second Sergeant John M. Gill, and Private Abraham Waldron (all from Pekin) found the chicken dinner and, according to their account, eighteen thousand dollars in gold. Later, Sergeant Gill discovered the artificial leg. The three soldiers ate the chicken dinner, turned over the gold to the Army paymaster, and kept the leg as a war souvenir. The Tazewell County unit continued to storm the Mexican position at Cerro Gordo. A wounded General Shields was rescued by Lieutenant William Tinney of Pekin who was later awarded a medal for heroism. Shield's division, including the the Tazewell County men, seized some Mexican artillery and turned it around on the Mexicans. As mentioned in the Mexican report above, the battle turned into a full scale rout with complete victory to the Americans. However, it was the leg that most intrigued the American troops, and they immortalized it in a song, a parody of "The Girl I Left Behind Me." My grub, and gave my leg in. All going on a bender. To go across the waters. The Leg I Left Behind Me. The Illinois Volunteer regiment would eventually become known as the Illinois National Guard. Lieutenant Tinney returned to Pekin where he became an almost legendary figure, holding many public offices over many years. Sergeant Rhodes kept the leg on display in his home. However, interest in the leg remained so high, Rhodes along with Gill and Waldron traveled extensively, charging 10 cents a person to view the leg. Eventually, they turned the leg over to the Illinois State Military Museum which is now part of the Illinois National Guard. And what about General Santa Anna? After the loss of Mexico City about five months later, he was returned to exile. However, he was eventually recalled by the centrists in the government to become President again in 1853. But, he found the government to be bankrupt. In order to raise money, he sold 45,000 square miles of Mexico in what is now Arizona and New Mexico to the United State (The Gadsen Purchase). This enraged his opposition - he was soon disposed and exiled again to the Caribbean, never to return to political office. "General Antonio Lopez de Santa Anna died in this city on the 21st inst. However he may have been condemned by parties, his career formed a brilliant and important portion of the History of Mexico, and future historians will differ in their judgment of his merits. 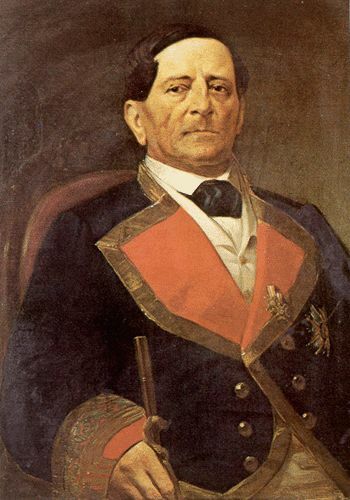 General Santa Anna outlived his usefulness and ambition, and died at the ripe age of eighty-four. Peace to his ashes." "General Santa Anna's cork leg, captured at the Battle of Cerro Gordo, Mexico, by Private A. Waldron, First Sergeant Sam Rhodes, Second Sergeant John M. Gill April 18, 1847, all of the Fourth Regiment, Illinois Volunteers of the Mexican War"
General Santa Anna's prosthetic leg is currently part of the Illinois State Military Museum's collection. The leg is displayed on the second floor of The Adjutant General's (TAG) building at Camp Lincoln, Springfield, Illinois. Over the years Santa Anna, the Mexican government, and the State of Texas all have tried to retrieve the leg. In 1942, two Chicago Democrats introduced a bill to return the leg as a sign of solidarity with Mexico against Nazi Germany. Republicans defeated the measure, saying "the Democrats don't have a leg to stand on". In 1998, Santa Anna's leg had another few minutes of fame when the animated television series King of the Hill did a show describing how Santa Anna lost his leg. Ramon Alacaraz. The Other Side: Or Notes for the History of the War Between Mexico and the United States. Written in Mexico. Albert C. Ramsey, translator. (New York:1850), pp. 208-214. Antonio Lopez de Santa Anna, Sons of DeWitt Colony Texas. Wallace L. McKeehan, Editor. (Accessed November 2000). "Capture of artificial leg brought Illinois town its name", Champaign News-Gazette, 26 April 1998. "Pekin men put state one leg up", Peoria Journal Star, circa 1986.